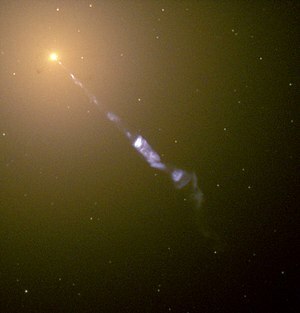 Hubble Space Telescope image of a 5000-light-year-long (1.5-kiloparsec-long) jet being ejected from the active nucleus of the active galaxy M87, a radio galaxy. The blue synchrotron radiation of the jet contrasts with the yellow starlight from the host galaxy. An active galactic nucleus (AGN) is a compact region at the centre of a galaxy. This central region radiates huge luminosity over the electromagnetic spectrum. The radiation from an AGN is thought to be caused by mass dragged in by the gravitational pull of a supermassive black hole at the centre of the host galaxy. This electromagnetic radiation is observed in the radio, microwaves, infrared, optical, ultra-violet, X-ray and gamma ray wavebands. A galaxy hosting an AGN is called an active galaxy. AGN are the most luminous and persistent sources of electromagnetic radiation in the universe. They can be used to discover distant objects. All theories about the cosmos have to account for AGNs. They are one of the basic facts about the universe. So-called relativistic jets are extremely powerful jets of plasma which come from some AGNs, notably radio galaxies and quasars. Their lengths can reach several thousand or even hundreds of thousands of light years. ↑ Wehrle A.E. et al (2009). What is the structure of relativistic jets in AGN on scales of light days?. http://www.nrao.edu/A2010/whitepapers/rac/Wehrle_AGN_jets_GCT.pdf.